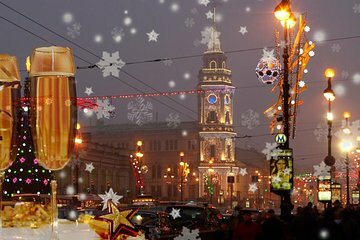 Experience St Petersburg at its festive best on a private 4-hour Christmas and New Year walking tour, with dinner and a folklore show to finish. With an expert guide, stroll around some of the city’s famous and lesser-known sights. Absorb the decorations along the Nevsky Prospekt and River Neva banks, admire the floodlit Hermitage and Kazan Cathedral, and hear tales of the city’s Christmas, New Year and ‘Old New Year’ customs. Lastly, enjoy a traditional Russian dinner (own expense) accompanied by a rousing gypsy folklore show of music and dancing.